No single type of extinguisher is totally effective on every kind of fire. So before buying a fire extinguisher, it is vital to look carefully at what type of fire it has to be used on. Also, with the emergence of smaller wet chemical fire extinguishers, households are starting to use these for deep fat fryer fires etc, although wet chemical fire extinguishers were originally used only in a professional kitchen environment. 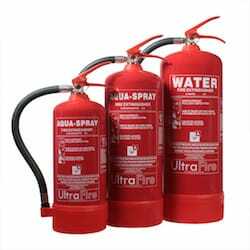 Water Fire Extinguishers are good for tackling fires involving burning paper, wood and soft furnishing (Class A fires), as the water soaks into the materials and cools them, while extinguishing the fire. This type of extinguisher does not contain harmful chemicals but has a low firefighting rating. Due to this, water fire extinguishers are usually large and heavy to overcome their lack in firefighting power. It is also important to remember that water is an electrolyte and conducts electricity. Care must therefore be taken with regards to accidental use on exposed power cables. However, both the weight and the conductivity problems can be overcome by using water extinguishers with environmentally friendly additives. Water extinguishers with additives have a higher firefighting rating which, therefore, allows the use of smaller and lighter extinguishers. Many water extinguishers with additive are also safe for accidental use on electricity. To make sure that they are safe make sure that they have been dielectrically tested. As they are mostly free of harmful substances, water fire extinguishers are especially suitable in households where children have access to the extinguishers and an accidental discharge is possible. Foam Fire Extinguishers, also called AFFF (Aqueous Film Forming Foam) create a smothering film of foam over the fire, which starves the fire of oxygen. The foam also penetrates porous materials and cools the fire through evaporation of the water content in the foam. As the foam creates a foam carpet on burning liquids like petrol, foam extinguishers are also suitable for flammable liquids and areas where man-made fibres in soft furnishings and carpets might liquidise under the influence of heat. Foam extinguishers are safe for use with electrical equipment if they had a successful dielectric test and are used at a safety distance of 1 meter. The electrical equipment will of course be damaged by the liquid. CO2 (Carbon Dioxide) Fire Extinguishers contain only pressurised CO2 gas and therefore leave no residue. This type of extinguisher is suitable for use on fires involving burning liquids (Class B fires), but is also a good solution for quenching fires involving computer equipment and other electrical appliances, as it does not cause damage to the electrical items and does not cause the system to short circuit. It is important to remember that when using CO2 extinguishers there is a possibility that once the smothering CO2 gas has floated away the fire may re-ignite if the source of the fire is not removed (eg switching off the power supply) or if the materials are still very hot. Please be aware that CO2 extinguishers that are not fitted with double-lined swivel horns may cause your fingers to freeze to the horn during the deployment of the extinguisher. Always select CO2 extinguishers with frost-free horns. CO2 extinguishers are NOT suitable for deep fat fryers, as the strong jet from the extinguisher carries the burning fat out of the fryer and into the room! Powder Fire Extinguishers, such as ABC powder extinguishers or dry powder extinguishers, are suitable for fighting class A,B and C fires. ABC powder extinguishers have a very good fire fighting capacity, but the powder does not soak into materials and does not have a good cooling effect on the fire. This can result in the fire re-igniting, if it is not properly extinguished. Care must be taken when using powder extinguishers that you do not inhale the powder. Powder extinguishers should therefore not be used in small, confined spaces where there is a risk of inhaling the powder. 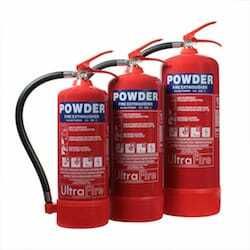 In fact the British Standard does not allow powder extinguishers in offices and living accommodations any longer. The clean up after applying a powder extinguisher is also very difficult and the powder causes damage to soft furnishing, carpets and computer drives etc. So a careful balance has to be struck between the generally quite cheap but powerful powder extinguishers and the cleaner, but less powerful and sometimes more expensive foam / water (with additive) extinguishers. For a household, be careful not to buy just BC rated powder fire extinguishers, as they generally are not suitable for burning solids. BC rated powder extinguishers, however, can be used for cars. Water Mist Extinguishers, also called ‘dry water mist extinguishers’ discharge a jet of mist which wets and cools the surface of a burning item. The fine mist also partly evaporates close the burning surface and as it massively expands, the resulting steam expels oxygen from the area, thus starving the fire of oxygen. As the water droplets are very light, they do not sink below the surface of hot burning liquids, therefore avoiding the explosive reaction of ordinary water extinguishers used on burning oil or fat. Water mist can therefore be used on fat fires. Certain brands of water extinguishers, eg UltraFire contain only de-ionised water which cannot conduct electricity and can therefore be used on electrical items in homes and offices (up to 1000 Volt at a safety distance of 1m). Water mists are therefore real broad spectrum extinguishers. Wet Chemical Fire Extinguishers are especially designed for use on kitchen fires involving burning oil and deep fat fryers (Class F fires). These extinguishers come with a special, long application lance which allows you to safely lay a cooling layer of foam on top of the burning oil. They can also be used on Class A fires, although their fire fighting power for general risks is not very strong. Alternatively, a (kitemarked) fire blanket can be placed over the pan containing the burning oil / fat. The pan should then be left to cool down. NEVER carry the pan outside or lift the fire blanket after a short period of time to inspect the burning oil as the introduction of oxygen through this action can reignite the fire. NEVER use pressurised water, powder, CO2 or foam extinguishers on fires involving burning fat, as the pressurised jet can cause the burning oil to be carried out of the pan onto surrounding surfaces causing more damage and a larger fire to tackle. You can, however use “Dry Water Mist” extinguishers on oil and fat fires, as the fine mist does not enter the surface of the hot liquid but stifles the supply of oxygen while cooling the liquid. It also creates a safe layer between the user and the fire. For businesses the service company maintaining the extinguishers will usually offer to remove the old units free of charge. Residentially used extinguishers can either be discharged and disposed of through the residential waste or be dropped off at the local recycling centre. Please be aware that it can be very difficult to discharge an extinguisher as a lay person, especially powder fire extinguishers, as the powder will get absolutely everywhere! If you are using a fire extinguisher on a fire, keep yourself on the escape route side of the fire. Safelincs has introduced a fire extinguisher range with a ground-breaking 10 Year Warranty on all components, exclusive to Safelincs. The extinguishers are manufactured in the EU and have been designed with longevity and ulterior quality in mind. The armatures were designed for strength and can be serviced with all standard tools! The strong head design ensures that the extinguishers will not get damaged in transit. And all at a price level that can compete with all other major brands. A new fire extinguisher has now been introduced which is kite marked to EN3 standard and is entirely maintenance free, requiring NO yearly engineer visits or re-fills for the products’ entire 10 year life. Further information can be found here.